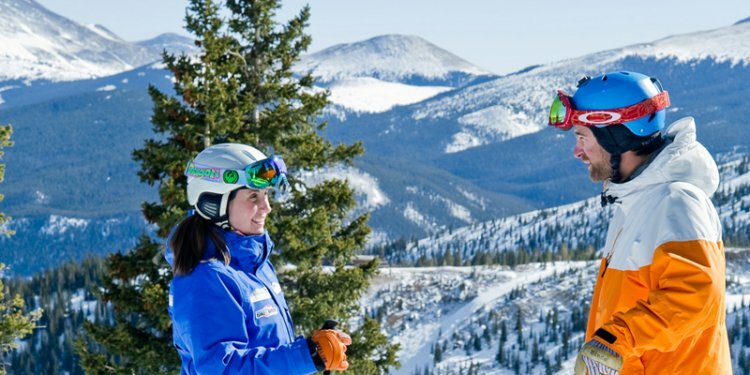 There are plenty of beginner runs and easy-to-ride magic carpets and chairlifts throughout the ski resort that make Breckenridge a great destination for people looking to learn how to ski or snowboard. The bottom areas of Peak 8 and Peak 9 are the main Breckenridge beginner skiing zones. Getting to these areas is easy from anywhere on the mountain. Boasting over 90, 000 lessons a season, the Breckenridge ski school is one of the best in North America for getting new skiers and boarders on snow. Every beginner should take at least one lesson to learn the fundamentals of skiing or snowboarding. You’ll be happy you did. Beginner skiers and boarders will spend most their time at the bottom of Peak 9 before moving on to more challenging runs. Getting to the beginner area at the bottom of Peak 9 is very accessible thanks to six chairlifts and a couple of magic carpets located in this zone. You won’t have to navigate through intermediate or difficult terrain to get here, plus the magic carpets at the bottom of Peak 9 allow beginner skiers to learn how to ski without riding chairlifts. Once beginners have graduated to riding the chairs, the QuickSilver Super 6 chairlift accesses several, longer beginner runs. The Lower Lehman trail and Frontier Run, located at the bottom of Peak 9 also, are two great, easy runs. Ripperoo’s Forest is a tranquil trail through the trees on Peak 9 ideal for young beginner skiers and snowboarders. The base of Peak 8 is another zone where beginner skiers will spend a lot of time during a Breckenridge ski trip. The lower portion of Peak 8 is where beginner skiers will find one of Breckenridge’s most renowned green runs: Four O’Clock. This gentle slope goes on and on, and you can ski all the way to downtown Breckenridge if you’re inclined. The Breckenridge ski school and daycare facilities are located at the base of Peak 8, too. The best way to learn how to ski is to take a lesson and, as one of the best in North America there are few resorts that can offer beginners what Breckenridge ski school can. Group lessons are a great way to meet new people while learning a new sport, and private lessons allow for one-on-one instruction. Private lessons at Breckenridge Ski School provide undivided attention and instruction, and you’ll get video analysis, front of the lift line privileges, and local advice about the best places to ski from your instructor during the ski lesson. Be sure to ask about the First-Timer Discovery Series at Breckenridge which includes discounts and packages on beginner ski lessons, ski rentals and lift tickets. The Kids Discovery Series aims at getting children ages three to 13 the proper instruction and the Burton Learn to Ride and K2 Learn to Ski programs are made for adult beginner snowboarders and skiers, respectively.